Brewood Music Festival organisers are set to welcome back two of the best performers from recent festivals, to kick-start a fundraising campaign ahead of the 2020 main event. If you have enjoyed Brewood Music Festival over the years you will most likely know that the event is staged bi-annually by a group of village volunteers on a not-for-profit basis. Funding for is secured from ticket sales for the main event, sponsorship, grants and advertising. Plans are already being formulated for the next festival in 2020. But before work towards the 2020 event can begin in earnest, help is needed to kick-start the process. Over the coming months a few previous festival favourites will be invited back to the village to perform at Jubilee Hall. These fund raising events are key in enabling organisers to ensure that the festival can continue to be staged. For the first of these events we’re delighted to be welcoming back Ricky Cool & The In Crowd to the Jubilee Hall on Saturday 2nd March. Tickets priced at £10 each will be available to buy online at https://www.brewoodmusicfestival.com/buy-tickets/ and from The Mess and Lazy Days in Brewood Village itself. Doors will open at 7.30pm and the band will play two sets beginning at 8.30pm. Following quickly behind will be an extremely welcome return for the Delray Rockets who last performed for us back in 2016. Again Jubilee Hall will be the venue, with the gig taking place on Friday 12th April. Similarly tickets are available priced at £10 online at https://www.brewoodmusicfestival.com/buy-tickets/ and from The Mess and Lazy Days in the village. Doors will open at 7.30pm and the band will play two sets starting at 8.30pm. Tickets bought online will be for collection on the night, at the venue only. Ricky Cool performed at our last festival in 2018 and we’re one of our most talked about acts in the months following the festival. Ricky Cool and the In Crowd serve up a gorgeous gumbo of sounds, similar to those found in the clubs of Soho in the early years of Mod mania. Original numbers are mixed in with great arrangements of classics, to give you a musical mix that will have your feet itching to dance. 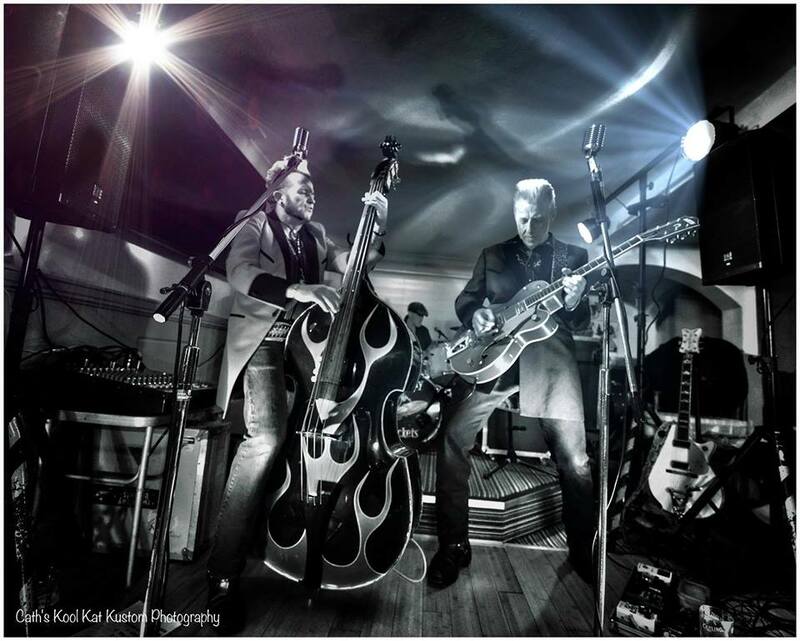 The Delray Rockets deal in ‘Hi Octane Rockabilly’ with a real in your face sound. Don’t be fooled by the onstage setup of a double bass, Gretsch guitar and stripped down drum kit, looks can be deceiving. Once the amps are flicked on and the first beat is struck, hold onto your hats cos’ you’re in for a hell of a ride. Comprising members, Gaz Le Bass, Oz Osbourne and Rik, the band really kicked up a storm during their appearance at the festival back in 2016, remaining one of the most talked about acts in recent years. 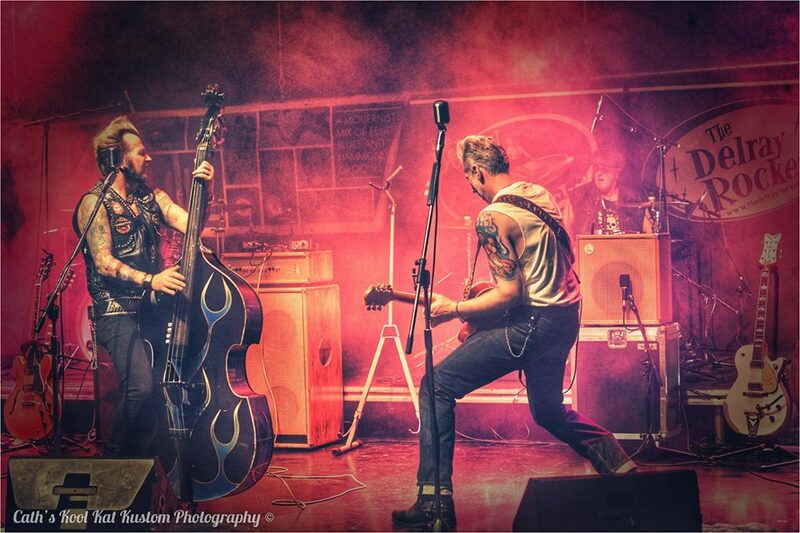 Gaz has played with a host of great musicians including Darrel Higham, Dave Edmunds, Robert Plant and Charlie Gracie. Oz played in various bands throughout the nineties before finding his rightful home in the Delray Rockets. 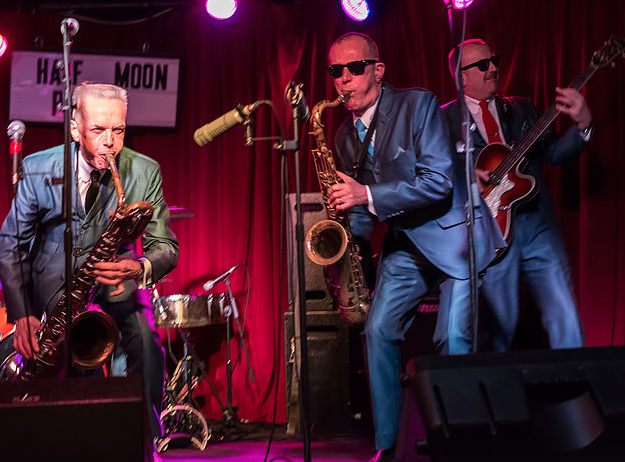 Rik has been hitting the skins since the 70s and despite enjoying many styles always wanted the chance to play Rockabilly, he’s certainly making the most of that chance now! Please support the festival at these two fantastic nights if you can. Money raised goes directly towards the next festival and both bands will provide outstanding entertainment. Be sure to keep checking back to the website for further festival news as it happens as well as following Brewood Music Festival on both facebook and twitter.